Performers include: Jason Alexander, Julia Louis-Dreyfus, Michael Richards, and Jerry Seinfeld with Estelle Harris, Wayne Knight, Len Lesser, Barney Martin, Phil Morris, John O’Hurley, Liz Sheridan, Jerry Stiller, Heidi Swedberg, and Patrick Warburton. 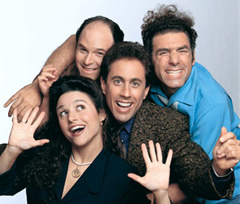 One of the most popular sitcoms of all time, this show about “nothing” follows the adventures of four self-involved New York friends: easy-going Jerry Seinfeld (Jerry Seinfeld), neurotic George Costanza (Jason Alexander), assertive Elaine Benes (Julia Louis-Dreyfus), and wacky neighbor Cosmo Kramer (Michael Richards). The series is also home to a wide variety of strange minor characters. The most frequent were overweight postman Newman (Wayne Knight), George’s girlfriend/wife Susan Ross (Heidi Swedberg), George’s overbearing parents Frank and Estelle Costanza (Jerry Stiller and Estelle Harris), Jerry’s eccentric parents Morty and Helen Seinfeld (Barney Martin and Liz Sheridan), Jerry’s crazy Uncle Leo (Len Lesser), Elaine’s airheaded on-again-off-again boyfriend David Puddy (Patrick Warburton), Elaines’s eccentric boss J. Peterman (John O’Hurley), and Kramer’s lawyer Jackie Chiles (Phil Morris). NBC executives contact Jerry and George and decide to add their old pilot Jerry to the fall schedule. The two plan on moving to Los Angeles but first decide to vacation in Paris with Elaine and Kramer. The NBC private plane experiences turbulence (because of Kramer) and is forced to land for repairs in Massachusetts. The four friends see an overweight man getting robbed and mock him rather than trying to help. They’re later arrested for breaking the Good Samaritan law. Many former series guest stars testify during the trial about the foursome’s past selfishness and lack of caring. By the end, the judge sentences the four to a year in prison. There’s been no news of any plans to revive the series or characters. • A one-hour retrospective aired prior to the finale episode. • The last episode was criticized by many as being too harsh and vindictive towards the characters. Others appreciated the inventive way of resurrecting a great number of minor characters from past seasons. The finale episodes boasts 60 guest stars. • Seinfeld’s was the third most watched TV series finale in history, behind MASH and Cheers. Pawn Stars: What’s a Signed Series Finale Script from Seinfeld Worth? Seinfeld: What If The CW Remade the Popular Sitcom? Seinfeld: A New Solution for NBC’s Ratings Woes? it’s been taken off and replaced by a bunch of garbage shows. Curb Your Enthusiasm did a season long mock reunion.